Tamsin Alleyn has been given a mission: travel to the Hunter Valley and retrieve an old sketchbook of debateable value, gifted to the Mitchell Library by a recluse. But when she gets there, she finds there is more to the book than meets the eye, and more than one interested party. Shaw Everdene, a young antiquarian bookseller and lawyer, seems to have his own agenda when it comes to the book but Tamsin decides to work with him to try and discover the book’s true provenance. The deeper they delve, the more intricate the mystery becomes. Tea always knew one day she would write a novel. It all began with a rather risqué story in the back of an exercise book at boarding school featuring the long suffering gardener- not really the ideal romantic hero but it was before she knew any better. Life and a few real heroes showed her the error of her ways and with a husband, a baby tucked under one arm and a half built house she entered a Mills and Boon writing competition. To her earth shattering amazement she won second place – the prize was a bottle of perfume. Next time she was determined to do better. Writing remained the stuff of fantasy. Her family, a herd of alpacas, a protea farm and a full time teaching job intervened until one day she decided it was time to do or die. No more procrastination. The characters and plots that had lived in her head for so long were clamouring to escape. In August 2011 Tea joined Romance Writers of Australia and her debut novel Tree Change was published as an ebook in November 2012. 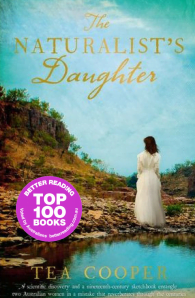 She has since written several other Australian rural stories both contemporary and historical. Her historical novels are published by Harlequin Enterprises (Australia). Tea is also a member of Hunter Romance Writers, the Australian Romance Readers Association and Wollombi’s Pencil Orchids. Tea Cooper lives in a stone cottage on one hundred acres of bushland, just outside the time-warp village of Wollombi, NSW Australia. When she isn't writing, Tea can be found haunting the local museum or chatting to the locals, who provide her with a never-ending source of inspiration.